We are collectors, hunters and shooters. 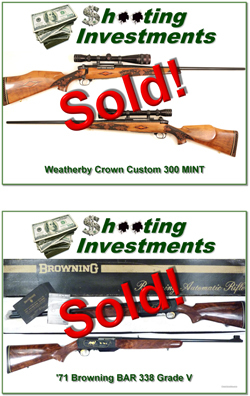 Shooting Investments has been selling top quality firearms on-line for more than nine years. We have sold thousands of firearms over the internet and have many repeat customers. We are not a retail gunshop and exclusively sell on-line, allowing us to maintain a low overhead, so that our savings are passed on to you. We know that quality firearms are smart investments. Firearms have continued to appreciate during the latest recession while many other investments, such as stocks and real estate have seen significant declines in value. It is always smart to diversify your investments. We believe part of anyone's investment portfolio should be in something they can enjoy. This could be a house at the beach or cabin in the mountains, fine art, coins or firearms. If you are like us, firearms will be one part of your investment strategy. We list all of our firearms on Gunbroker, Gunsamerica and Gunsinternational. In addition we sell many small parts on ebay. You are always welcome to call us to talk about Firearms. Thanks for visiting our website. We appreciate your business.